LOS ANGELES - Tyson Chandler savored the ovations when he first took the court in downtown Los Angeles. The cheers at the end were even sweeter. The Lakers’ newest big man got to represent his hometown Wednesday night for the first time in his 18 NBA seasons, and he came up bigger and better than even he expected in a hard-fought win. LeBron James had 24 points, 10 rebounds and nine assists, and Kyle Kuzma scored six of his 21 points in the final minutes of the Lakers’ 114-110 victory over the Minnesota Timberwolves. 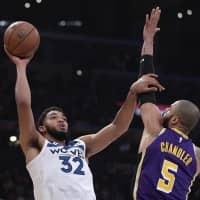 James, Kuzma and Josh Hart played major roles in the Lakers’ third win in four games, but they all directed praise toward Chandler, who joined the Lakers on Tuesday after reaching a buyout agreement with Phoenix. After LA’s savvy basketball fans welcomed Chandler to town with cheers, the veteran provided much of what the Lakers have been lacking this season. With only a cursory knowledge of the Lakers’ plays and schemes, Chandler still provided defense, rebounding and hard picks while playing a surprising 23 minutes. Chandler’s nine rebounds included two enormous offensive boards in the last minute. He then contested Derrick Rose’s final 3-point attempt, forcing a miss that essentially sealed the win. “You can tell he’s a young-old guy that’s happy to be back home, and he played with a lot of energy tonight,” said Rajon Rondo, who was thanked by Chandler for vocally directing him around the court. 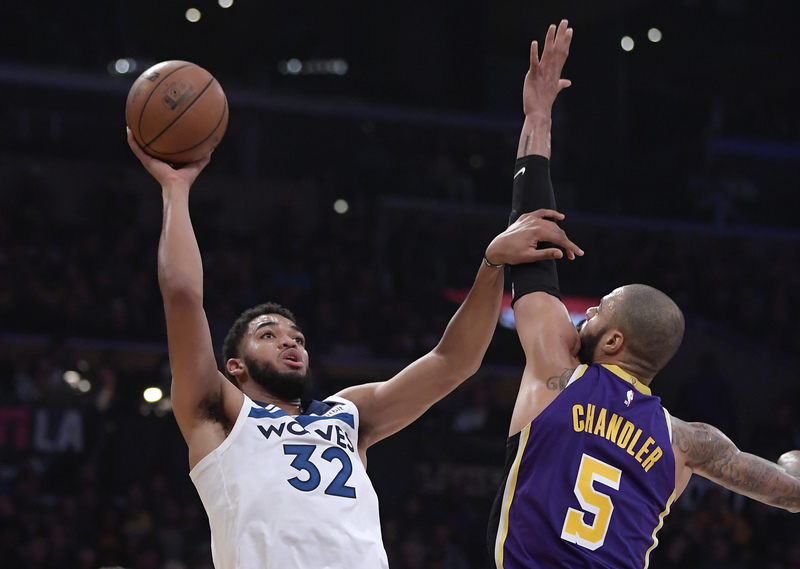 Kuzma’s fourth 3-pointer put Los Angeles up 111-104 with 1:51 to play, but Rose promptly hit back-to-back 3-pointers for the Wolves. After Chandler twice extended the Lakers’ ensuing possession, Kuzma hit one of two free throws with 9.5 seconds left. In Sacramento, Kawhi Leonard, who missed the two previous games with a jammed foot, scored 25 points and grabbed 11 rebounds, and Toronto topped the hosts. Pascal Siakam had 21 points for Toronto, Kyle Lowry had 16 points and eight assists, and OG Anunoby chipped in with 11 points. Buddy Hield and Willie Cauley-Stein each scored for 24 for the Kings. In Miami, Hassan Whiteside posted 29 points, 20 rebounds and nine blocks to lead the hosts past San Antonio. Whiteside, who missed the Heat’s previous game due to a knee injury, made 10 of 18 shots from the floor and fell one block short of what would have been the fifth triple-double of his career. Miami guard Wayne Ellington, who had only played 12 minutes this season prior to Wednesday, made his first start of the season and provided 20 points. He shot 6-for-10 on 3-point attempts as the Heat stopped a nine-game losing streak against San Antonio. Patty Mills led the Spurs with 20 points, while Davis Bertans added a season-high 19 points. In Indianapolis, Joel Embiid had 20 points and 10 rebounds to lift Philadelphia past the hosts. Victor Oladipo scored a season-high 36 points for the Pacers. Domantas Sabonis added 16 points and 11 rebounds. In New Orleans, Anthony Davis had 32 points and 15 rebounds as the Pelicans halted a six-game losing streak with a victory against Chicago. Zach LaVine led the Bulls with 22 points, Jabari Parker provided 20 points and 13 rebounds and Wendell Carter Jr. had 17 points and 11 rebounds. In Salt Lake City, Donovan Mitchell scored 23 points to lead six Utah players in double figures in a victory over Dallas. Alec Burks scored 18 points for Utah and Rudy Gobert had his 10th double-double in 11 games, contributing 17 points and 10 rebounds. The Jazz finally managed to record their first home win in five tries. Rookie Luka Doncic was Dallas’ top scorer with 24 points. In Memphis, Marc Gasol hit two tiebreaking free throws with 4.6 seconds remaining as the Grizzlies survived two late misses by Denver to remain unbeaten at home. Gasol and Jaren Jackson Jr. finished with 20 points apiece for the Grizzlies, who improved to 4-0 on the season at home. Gary Harris had 20 points to lead Denver, which had won five straight. In Atlanta, Tim Hardaway Jr. showed no ill effects from the bad back that caused him to miss the previous game, scoring 34 points to lead New York past the Hawks. Atlanta was led by rookie Omari Spellman’s 18 points and 10 rebounds, career highs in both categories. In Cleveland, Dennis Schroder scored a season-high 28 points as Oklahoma City picked up its sixth consecutive win by beating the Cavaliers. Oklahoma City was playing without point guard Russell Westbrook, who turned his left ankle Monday in a win over the New Orleans Pelicans. Paul George finished with 18 points for the Thunder and Jerami Grant scored 12 points. In Orlando, Detroit overcame two double-digit deficits to earn a victory over the Magic. The result snapped a five-game losing streak for the Pistons, who had started the season 4-0 before the skid. Orlando’s Evan Fournier, who hit a game-winning shot Monday night against the Cavaliers, scored a team-high 27 points, while Aaron Gordon and Terrence Ross had 15 points apiece.